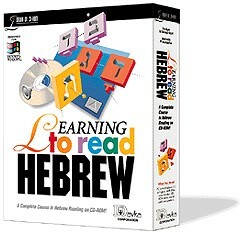 Details and specifications of Davka's Learning to Read Hebrew, £29.95 (GBP inc VAT RRP £39.95). Learn to speak modern Hebrew with this new language software from Davka Corporation. [Buy now] or call us on 0870 360 3699. See more jewish software. Designed by an expert Hebrew-language educator, Learning to Read Hebrew is a comprehensive program that teaches all aspects of Hebrew reading. All of the letter and vowel sounds are taught, as well as how they are combined to form words and phrases. The Hebrew pronunciation is taught according to the Sephardic practice used in modern Hebrew conversation. Learning to Read Hebrew includes full-featured audio! With a click of a button, your computer will pronounce the Hebrew words and phrases on your screen. Plus, pleasant Israeli music plays in the background, making the entire course an enjoyable and relaxing experience. Quizzes and review lessons are presented at the end of each lesson, as well as at the conclusion of the program. This ensures that material studied will be retained and understood. "The program is well organized in 10 lessons and free of gimmickry and clutter; anyone who spends several hours on the lessons and then reviewing them can succeed."